I got a Nook tablet on the very first day it came out, and last night I decided to send it back. This post isn't going to be an in-depth review; everyone has done one by now so I don't think it's worth my time. But I do want to explain why I'm returning it. I'm hoping my reasons will help others make a decision for and against the Nook Tablet. This is a great piece of hardware, and it works quite smoothly. If you go into this expecting a locked down media device then you will likely be happy with the Nook Tablet. But I'm returning it because that's not want I want in a $250 gadget. I bought the Nook tablet without really thinking about what it was or what I wanted to see. Rich Adin pointed that out when I wrote my first impressions post, and he was right. I hadn't really considered what I wanted out of the Nook Tablet. But after discussing this with a B&N contact, I realized that I went in expecting a tablet experience and instead I got an iPad-type walled garden experience. I don't want to live in a walled garden. I want to be able to install apps from anywhere, buy content from anywhere, and finally, I want to have more control over my device than Barnes & Noble allows. Do you know how everyone says that Amazon released the Kindle Fire so they could use it to sell you content? This is true, yes, but what I didn't realize until I put my hands on the NT was that B&N thought of it first (and they got it on the market long before Amazon). From the very beginning, the NookColor and Nook Tablet were not intended to be tablets. They are B&N's digital storefront. Their entire reason for existence is to sell you ebooks, apps, and other content, not so you can do anything with them besides buy stuff from B&N. Oh, and do you know the media subscription apps (Netflix, Rhapsody, etc)? I'll bet dollars to donuts that B&N gets a cut of the subscriptions - just like on iOS, the larger walled garden. I've posted before about the Nook Tablet having a DRMed bootloader and how that will make it difficult to hack. B&N did this on purpose; it makes escaping the garden that much harder. Yes, there's now a way to install apps via the web browser, but that was also designed to support the walled garden. That loophole acts as a safety valve. The NT owners who are truly desperate for a tablet experience can (with some difficulty) install apps, and that cuts down on the desire to fully hack the NT. Update: Shortly after I posted this review, an easy and permanent way to root the NT was released. You can find out more at XDA Forums. If you want to try the hack, go ahead. Just remember that B&N will break the hack with the next update. I have an iPad and while I chafe at the limitations imposed by Apple, at least with the iPad I am trapped in a huge garden. I could stay in there for years and never encounter the walls. This is not true for the Nook Tablet. First, there are hardly any free apps on the NT. I am pretty sure this is by design; B&N keeps the free apps out of their app store because that way they can sell you more apps. I'm all for B&N acting in their best interest but I will also act in mine. I already own lots of apps and I do not wish to buy them again. The app restrictions also mean that I cannot find certain apps in the Nook App Store that I can find anywhere else with no difficulty. For example, Overdrive's app isn't there, which means that I can't easily use library ebooks. Also, there are no reading apps in the Nook App Store. I don't expect to see competitor's apps; I just want the free ones like Aldiko, Coolreader, and Adobe Reader. And then there's the limitation on storage. I only have 1GB of space to load my own content. I'm going to leave aside the fact that B&N doesn't actually tell you this unless you read the fine print and the fact that it's not enough space for me. My objection is that as small as the walled garden is, B&N allows me to control an even smaller fraction. They decided what was best for the largest part of their garden, and I am just not happy with that. In spite of the fact that I paid B&N good money for the NT, this is far more their tablet than it is mine. I have to say that it is a little strange to be writing this. I came out of the Nook Tablet launch event thinking that the NT would meet my needs as a tablet better than the Kindle Fire. I got snookered by B&N's marketing, yes, and that remains a learning experience for me. If I had gone into this expecting a closed, ereader type of experience I would probably have been quite happy with the Nook Tablet. It really does have the best hardware and software in its price range. But when I invest $250 in a gadget I want to be able to extend the abilities of the device as much as I can. Here's the kicker. I can add the Nook app to a generic Android tablet and have all the B&N content I want while still having an open tablet experience. It won't be as polished of an experience, but that's okay with me. I value the openness more than the refinement. The fact of the matter is the Kindle Fire is far more open than the Nook Tablet. It's easier to find and install apps, load content from elsewhere, and I think I have more control over the KF. This is why I might be keeping the Kindle Fire but will definitely be returning the Nook Tablet. Took mine back Saturday for the same reason. If it takes more hacking than flashing from a card slot, it just isn’t worth it. FWIW, the locked bootloader was most likely required by Netflix (in turn required by the studios who supply them) in order to include the ramped-up HD version of their app. The Fire doesn’t have the HD streaming and thus didn’t have to lock it down. Can’t really blame them since HD is a big marketing point for them. That’s what the nook2android microSD card is for. You get the best of both worlds, a superior ereader(better than the kindle fire) and an open android tablet. Agreed Cheryl, that is why I bought my Nook Tablet and boot from both. thank you. you both are absolutely right. granted i have the nook color but i still love it. it has everything i need, a place to read and get all the books i want plus the ability to surf the internet at high speeds and so on. this is a great post. i’m wondering – do you have hands-on experience with the Kindle Fire enough to say if it suffers in the same way? i’m on a sort-of crusade right now trying to inform people about what exactly the difference is between the Fire/NT and a full-priced tablet (ie iPad) other than just the price. this information will undoubtedly be very useful! I own a Kindle Fire, yes. Aside from a few minor quirks, the KF is an open Android tablet. You don’t have to do anything with Amazon other than register it. The KF still lets you install third party apps and it’s not nearly as difficult to hack as the Nook Tablet. It might not be “open” but it comes close. I had a KF, but returned it. Not because I didn’t like the device – I really, really, really did love the device – but just because I already had an Android tablet, and thought $140 wasn’t worth it for a duplicate toy that was missing Bluetooth. Otherwise, after putting in Hashcode’s latest ROM, it was one of the best small form factor ICS tablets I’ve held in my hand, and the only thing I really wished for after that was bluetooth to hook my keyboard and headset too. It ran everything I threw at it as smooth as butter, performed even better than my ASUS Transformer I. If you want a cheap Android small form factor tablet to have fun with and get maximum bang for your buck, your best bet looks like the Nook Simple Touch reader, as long as you remember it only has the eInk display and Eclair. Excellent post and you make some great points. I was intrigued by what you said about the ability to install apps via the web browser being a loophole that was designed to support the walled garden. Do you really think B&N knew about the possibility of installing 3rd party apps via the web browser? If so, this means they may not take away that ability via an update, which has been my main concern. Because I am fine with the tablet as is; I have no desire to root or hack or anything like that. All I want is an ereader that can also install the apps that B&N doesn’t have, like my favorite comic reader and video player, etc. As long as I have that option, I’m fine being in the walled garden. My fear is that they’ll take away that option via an update, which really would decrease the value of the device. But now I’m really wondering if, as you suggest, they knew it was possible to install apps via the browser and they allow it to deter people from rooting. That never occurred to me- but it’s a really interesting idea. The feature is new with the v1.4 firmware and wasn’t present with the v1.3 firmware (on the NookColor). I do think it was intentional; it fits with the idea of a walled garden. FFS, the NookColor has been out all this time and you thought the Nook Tablet would somehow be different? B&N called it a tablet and they pitched it as being more open than the Kindle Fire. As i said at the end, I got snookered by the hype at the launch event. And besides, look how easy it is to hack the NC (there’s even an SD card you can buy that will hack it for you). That is really what I expected when the NT first came out. As Mike Cane said, FFS, you expect there to be a fully SD-bootable, alternative OS built by the community less than a week after launch? The original Nook Color took five months, and it wasn’t really _good_ until nine months after it was released. Android 4.0 source code came out the same day as the Nook Tablet. People working for free have their own priorities. I’m confused. I’ve already admitted to the mistake and explained how it happened. Why do you 2 feel the need to yell about it? Maybe I’m reading too much into your words. B&N selling it as a Tablet is misleading. That’s fine, and you explained your thoughts above. The N2A card and community version of Android for the Nook Color is not in any manner I know of supported by B&N. By saying you “expected” a community of volunteers to have the same level of support for the NT on the first day smacks of entitlement. The community does that work because it is fun and that you receive anything from those people at all is a gift. I can see, in a different light, how you weren’t necessarily criticizing the community but your own world view. I appreciate their hard work (as well as yours, Nate, in digging up these rumors and entertaining us), but I want to be sure that you aren’t trying to force volunteers into some sort of personal, unpaid job. Actually, it’s been just over a week and we’ve learned that hacking will be difficult if not impossible, and we’ve learned that rooting is probably going to stay an incomplete process. I wasn’t expecting the NT to be hacked the first week, but I was expecting the devs who had hacked the NC to do a proof of concept in the first couple days and show that it is possible. Instead we learned that the NT is even more locked down than the NC. Is there ANY 7 inch tablet that’s decently priced, fully accessible and comes with expandable storage? Every tablet seems to have some Achilles’s heel; the fire has limited storage, the nook is locked down, stuff like the xoom costs 400 dollars, etc. I’m wondering if there’s an option that comes closer to being affordable AND usable. Does something like that actually exist? Well, you’ve got your HTC Flyer, your Acer A100, and your Lenovo Ideapad A1. The Lenovo is the one trying to steal the show with price, but the HTC Flyer is the clear winner on performance and battery life. Kobo Vox is fully open and runs $199. The Vox is not fully open or at least not any more open than the Kindle Fire. The Vox has the GetJar market installed and you have to sideload all the other apps not available in the Get Jar Market. You can easily install the Amazon App Store on the GetJar market plus the Fire is faster and more powerful. I was supremely disappointed in the Vox (not to mention their awful customer support). The Vox does nothing to prevent sideloading, it lets you use all its storage as you see fit, and it has an expansion slot. And that is about as open as any android tablet is going to get. As for market access, expecting android market on anything other than an overpriced TelcoTab isn’t in the cards as Google wont allow it. Getjar is pretty decent and Amazon’s Appstore even more so. Kobo has traditionally had more teething pains with their new hardware than other vendors so being early adopters comes with some inconveniences but they usually clear them out in a month or two. It helps to know who you’re dealing with and what the market segment rules are. In android tablets this means it is best to stick with products with firmware that has been updated at least once and to understand that Android market is only for TelcoTabs and hackers. For the money, you can’t beat BigLots and the $99 Polaroid PMID701c (Android 2.3) or 701i (Android 4.0). Google Play is not included, but a number of ways to add it are posted on the Web. Unlike other tablets, these offer both twice the available memory and processor speed as other tablets at this price. Southen Telecom, the manufacturer, has yet to provide the firmware for these tablets online, which you would need if you put a password on one and forget what it is, as reflashing the tablet is the only way to reset from a lost password. I agree. I have both models and I’ve posted about them elsewhere on this blog. The HTC Flyer is $300 or so? and has everything on it. You can also use the KindleFire launcher with it, but I read that there are crashes and that’s not something I care to encounter much. I haven’t had one crash in over a week with the Fire. The things that Amazon doesn’t advertise or market particularly except to its existing customers is that they give every global customer 5 gigs of free storage in the cloud. Then they give another 5 gigs of free storage to Kindle owners for their NON-Amazon documents and books (as long as they’re not rights-protected). Not only do no Amazon-purchases count against the storage limits under any circumstance, there are other features. they don’t violate DRM). They kind of get you where you live. 2. The personal docs or books you put into personal-docs Kindle Cloud will now be syncable between or among devices and annotations will be backed up if you want. Customers have long requested that our personal books be sync’able too . And they quietly did this a couple of months ago. Nate and Felix noticed it before they announced it. Nate, you’re right. B&N don’t do opposition-research. At the conference you attended they actually said that Amazon is a closed system and that B&N has Netflix and Hulu but Amazon wants to have you watch only their movies or listen only to their music. But it had already been said by Amazon at the Sept 28 launch of KFire, that Netflix and Pandora already had early editions of Kindlefire. They’ve even been quoted as saying they don’t intend to stop rooters and that people can sideload and it’s been easy to do. You can’t stream your own content from the Cloud though and I find this problematic. Partly true, since your own content includes music content and it seems you can stream that as well, for the $20/20 gig package which allows free storage and streaming for all your music, unlimited. About the same price as a microSD card. They don’t have a package like that for video streaming, which is more costly for them. With BN, you can’t even use the cloud for any non-BN material. And of course being able to sync non-Amazon books and documents i not something other tablet/e-reader makers are offering either. Good points, Andrys. And you’re right, Amazon does offer 5 gigs of storage (and more if you’re willing to pay for it). But for folks like myself who don’t really want to have to rely on “the cloud” for their content, Amazon is stiflingly limited. It’s a great concept, but until we reach a point where you can download a 700 MB video file to your device in 10 seconds, online storage really doesn’t seem like a viable option. Great for books and maybe music, but for video- it’s really pointless. It really cuts off options. Especially so if you don’t have access to wi-fi, say if you’re on a flight, etc. Without wi-fi, whatever’s on your tablet is what you’re stuck with. That doesn’t really work for me. I don’t need 200 gigs of content, but I’d like a wider selection of movies and music to choose from and even with wi-fi, I don’t want to have download stuff in order to get it. Additionally, new games are going to take up even more space, especially as games develop and get larger in file size, etc. A 1 gig game would take up a huge chunk of your available space on the kindle fire. Of course you can delete it and redownload it, but you better have an hour to spare (and a wi-fi connection). With an SD card however, you can load up additional content and it’s there when you need it. Games, movies, music, whatever. It just seems much more freeing than being locked down to 6 or so gigs. The cloud is a great idea, but again, until downloading is as fast as loading something onto an SD card, it really seems limiting. Just my nickel minus 3, of course. I’ve been wondering what using the Nook Tablet, playing HD video from the microSD card is like. I guess that with a Class 10 card, everything should be fast and smooth enough. I think the Nook Tablet runs only mp4 videos? I have a Nook Color and found out it won’t be able to run BN’s Netflix. But I’m not going to trade up since I’ve got the KFire. Just clarifying that the “Class” specification is just a indication of the guaranteed minimal write speed and nothing else. Though in terms of average quality a class 4 or higher is usually fine for playing videos. Sometimes even a Class 2 will still play videos fine, but you mainly only need to worry about the Class for writing data. So a Class 10 would be mainly desirable if you’re using say a digital camera and are planning on recording full HD. Although, the faster write speed can mean faster responsiveness as well. Since SD’s can’t read and write simultaneously. So fast write speed can help reduce latency. The newer SDXC, which also applies to the micro version, also will start introducing a new pin out for higher data IO speed. Mind that aside from the high speed pin, the versions of the cards without the extra pin will be backwards compatible with regular SD readers. So for some devices at least you can also opt for higher than 32GB capacities. Like I believe they’ve confirmed a 64GB card worked in the Asus Transformer for example. All of which gives more reason to consider a device with a memory card expansion option. Exactly what I have been saying and why as much as I use and love Amazon the Kindle Fire is out for me. I have no Internet at home and even if I did relying on the “Cloud” and having to re-download all the time is not what I want from any device. I don’t find the argument of (future) alternate ROMs a compelling reason to keep (or buy) a Nook “tablet”. Alternate firmware is a last resort for trying to get full value out of hardware where substandard firmware keeps you from doing what should be possible. (OpenInkpot for Hanlin V3, for one). I’d rather not do it again. In my book it is one thing to open up a locked system so you can *add* value with external apps (say, hacking a Sony T1 or Nook STR) because you get to keep the original out-of-box functionality and another to give up on what defines the product in the first place. If you’re looking forward to replace the supplied firmware with some generic, unsupported firmware you’re, in effect, saying the supplied firmware is worthless. And if the firmware is worthless, regardless of how good the hardware, why keep it? Walled garden systems are package deals; most people will either buy the complete package or go elsewhere. 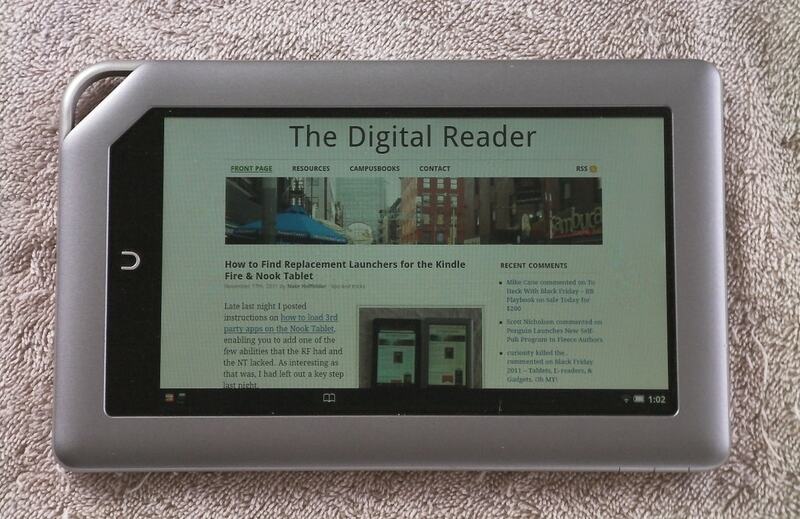 If you find the Nook “Tablet” hardware interesting, just wait a couple month. Once the Fire intro ripples through the market there’ll be plenty of comparable options from other second tier vendors. You purchased a Pocketbook 701, so I understand your reluctance. The Pocketbook I got knowing full well what I was getting into; a techie toy and generic Android webpad. Not a productivity tool or a finished product. Just a cheap way to learn about android. The BeBook, however, was billed as a stable, fully supported universal-format reader–which it was until they switched horses and changed from Mobi-DRM to Adept and promptly stopped working on anything but the Adept reader so the reader apps for other formats were instantly deprecated. Not amusing. OpenInkpot provided better legacy support until the developers started branching out all over, following other platforms and new GUIs and whatever shiny toy caught their eye. Which was fully right for them but taught me not to *rely* on hobbyists and hackers to provide what is the vendor’s responsibility. Which is my key point on the NT: just because a hack works today is no guarantee it will work tomorrow. At the mainstream consumer level (not the hobbyist level) products need to be evaluated on their Out-of-box experience, not on what some volunteer hacker makes of it. One thing I’ve learned (the hard way) is that second tier vendor tablets are often second tier for a reason. The Nook Tablet is perhaps my 6th or 7th tablet, after trying and returning a wide variety of cheaper tablets from lesser known brands. All of them had various problems (terrible battery life, system freezes, apps shutting down, etc) and finally I realized that I had to wait for a tablet from a company that exercises some sort of quality control. Barnes and Noble may exercise too much control over their products, but they do seem to insist on a quality product. Many of the second tier vendors don’t seem to do that. Not saying all of them, but a lot of them will just throw a version of android onto a tablet and release it into the wild whether it’s ready to go or not. The low low prices will entice suckers (like myself) but the terrible user experience is usually enough to make people think twice before dipping their toe in that pool again. Things like being able to install APK files, or being able to root the device are only important for tech nerds like us. But we are only a very small number of users. The average Nook user finds just dragging and dropping files to the Nook something too difficult to even contemplate. I do not think the average Kindle user is that much different. So although Amazon has enabled installing APK files, most Kindle users do not know what APK file are, and will never install them or root the Kindle Fire. They will just buy apps from the Amazon app store. So for the average user the Kindle Fire is just as closed a tablet as the Nook Tablet. The 1GB memory thing is a non-issue. For $10 you can buy a 8 GB micro SD-card that will give you more memory than you will ever have on the Kindle Fire. And there are goods reasons for the current memory partition model. As for the number of available Nook apps. B&N has promised thousands of apps before the end of the year. I expect them to keep that promise. Several people have been told by B&N representatives that there will indeed be a big change for the apps store before the end of the year. I hope this will happen after the big 1.4 update for the Nook Color. I’m not so sure. Last year you might have been right, but Android tablets are so common now that most users will know how to install apps or they will learn. It’s now the norm. And besides, there have been a bunchaton of posts about installing apps on the KF and NT. The average user probably knows how to do it now. The regular Kindle forums on Amazon and at Kindleboards are filled with mom and grandmom types (w/ registration in the millions) , with over 50,000 at just the independent Kindleboards.com and 5.5 million page views per month. The Amazon Kindle boards will have more but they don’t publish activity stats. Kindle owners on “home’ style forums like Kindleboards are more savvy than thought. And the Kindle doesn’t have to be rooted. They just allow side-loading of non-Amazon apps without the workarounds Nook Tablet readers have go through. The average Kindle reader will find no resistance besides max-6.5 gigs for user-files, at any time in just putting non-Amazon books and video on their unit, which allows the 6.5 gigs for user files of any type, whereas Nook users on their forums have been upset by encountering the 1-gig limit for their own files after they changed the partitioning in May 2011 and then HID the BN-purchased books so that customers couldn’t access even the titles of their Nook books via normal file handling. Coincidentally (not! ), Nook books could be shared by just sharing the expired credit card # used for DRM, and this change made that harder. I don’t know how reliably their software updates change things. Too often they remove capabilities. I was able to highlight, copy and paste on the web with the NookColor until the first big update. Most of the requests we made on the forums were not addressed, but they had stability issues and odd ways of handling personal books in their library and home screen to get better policies for. I like my NookColor a lot, using it daily until the KFire, but I have no real confidence in BN updates doing much with anything but maintenance fixes. The one meaningful fix was NST’s font-rendering. The regular Kindle forums on Amazon and at Kindleboards are filled with mom and grandmom types , with over 50,000 registered at just the independent Kindleboards.com and 5.5 million page views per month. The Amazon Kindle boards will have more but they don’t publish activity stats. I visit needlework and kitchen forums and you’d be surprised at what those people are doing with their Kidnles. The average Kindle reader will find no resistance besides max-6.5 gigs for user-files, at any time, in just putting non-Amazon books and video on their unit, which allows the 6.5 gigs for user files of any type, whereas Nook users on their forums have been upset by encountering the 1-gig limit for their own files after they changed the partitioning in May 2011 and then HID the BN-purchased books so that customers couldn’t access even the titles of their Nook books via normal file handling. I like this post, quite a bit, actually. Android is a big ocean, the whole point is people should get what they want, there are simply too many options out there right now to think everyone should get the same thing. As for me- I’m a fan of all things Barnes and Noble. I was previously going to stick with my unrooted NC, but am now considering an upgrade to the tablet. Honestly, I’m really liking the nook tablet. It’s a solid device; nice and light, very sturdy, fast response times and all that good stuff. The walled garden aspect does trouble me a bit, but as long as I can load my own content, it’s a non-issue. If they really did leave in that loophole to allow apks to install via the browser, it’s a perfect match for someone like me. They got my money, I got an excellent tablet. But for those who want total freedom, yes, I guess the search continues. Oh ye of little faith. Ye may find a site called XDA Developers to change thy thoughts on yon tab. A mere 5 minutes will erase all points mentioned above. A simple root will open all worlds – Amazon App Store, Android Market, Side load, etc. “A simple root”? Don’t kid yourself. The root process isn’t simple nor is it a fixall. Nor is it guaranteed to last. Let’s not forget that the recent Nook STR update blocked the previous rooting tools. And the STR *hardware* isn’t locked like the NT hardware. That B&N is spending that much time and effort (read:$$$) to block hacking (signed bootloaders is not an anti-piracy measure, it’s an anti-hacking move) means that they are serious about preventing it. At some point they could easily start blocking access to the online services for hacked NTs as other walled garden vendors do. Eh. I was more pissed off by B&N removing the Nook Touch browser backdoor than the changes that made rooting more difficult. I expected rooting methods to require changing. Right now, it all works as before if you do it manually. The automagic TouchNooter version(s) now experience some transient problems with Google Apps/Market, which might be a Google problem. Good review but I am one of those who know going in that it is a “walled garden” and I am okay with that. I have had a Nook Color for a year now, non-rooted. I am happy with it but would love to upgrade to the NT with its faster processor. I consider myself an average user but don’t have a clue what an APK is or why I would care. The forums I follow have never mentioned it, of course I am not rooted….perhaps that is why I have not come across the term. Perhaps B&N is wrong to call their new gadget a “tablet” but I think that is partly the fault of the rooting community who took the NC and have had a blast this year rooting the heck out of it, making everyone think it was worthy of the name “tablet”. I think that given enough time the XDA folks will find a way to hack/root the NT also. It’s still early. You know those guys love the challenge! Well the only semicomplicated process for rooting my Nook Tablet was installing the drivers on my Windows PC so that my computer would see my nook. But after that, it was super simple. All i do is turn on debugging mode on the nook and do the one click app called “NookandZergy.bat.” and bam im permanently rooted. So with that widows based one click app, its super easy. Im not sure what you mean by you finding it very complicated? The one click app even auto installs all the google apps automatically for you so you dont have to mess with them, like google market, etc. So I dont see how its complicated? Also once your rooted, you have all the same benefits of the kindle fire except you have better batter life, more ram, and possibly clearer screen. With mine rooted with that simple one click windows app, I would rather have my NT then the fire due to the hardware benefits. I mean I have the Google market, Amazon app store, various ereader programs, i even installed slingplayer mobile on it, lol. (did a google search for the apk, lol) So my NT is awesome. So in the the end all you arguments are mooted by these facts I mentioned above. Oh well, I guess everyone is entitled to there opinion lol. Okay, that moved faster than i thought. It was only on Sunday that it required the Android SDK, the command line, and a hacked script. Mooted? I don’t think so.The most recent Nook touch update broke the previous hacks, right? Also, didn’t at least one of the NC updates break prior hacks? I think it’s safe to assume that B&N plans to continue to break the hacks, which I think proves my point that this is more their tablet than it is yours. Shouldn’t you be selling off your IPADs on Ebay as well? If it were my personal device, yes. You are correct in that I should object to both iOS and the NT equally. But I have to have an iPad so I can blog about it. And I have cut back on my iOS devices; my iPod Touch was given away a long time ago. Just because an update causes an incompatibility with a rooter does not mean that B&N is specifically targeting it. It is not their job to make sure rooters work across software updates. True, but remember that the Nook Tablet has a signed bootloader. I think that is a sign that B&N did break the hacks on purpose. They want to lock down their tablet. yes I can understand that if your arguing that all of the rooting is eliminated by to use your words, “The most recent Nook touch update broke the previous hacks, right?” My follow up would be why would you even choose to update the nook touch via Barnes & Noble, if you rooted it? I mean once your rooted, you dont need B&N for anything anymore. There Updates would enhance there User interface and there walled garden, but since you dont want any of those, why would you bother to update it. The simple answer to what you just said is once you “easily root your tablet”,,,you simply dont update your nook OS. I mean you only needed them to get there underlining gingerbread OS, and once you got that, your android market is the only update center you need. That only applies if you don’t want to access B&N’s content. On the other hand, if you want access to the B&N content (and they have some compelling stuff: Peanuts, for one, lots of kids stuff that isn’t available through Nook for android, Netflix HD, etc) then you are going to have to keep their apps in place and upgrade when they tell you to. And there goes the hack. This isn’t theoretical: Apple does it to iPhone users. Sony and MS do it to console users. They actively fight hacking and block hacked hardware from their domains. If B&N stays the course, that is their next logical step. Yes, you can buy an NT and turn it into a generic, buttonless android tablet. But then, why buy/keep a Nook to start with? The most important update change, for me, was their making the fonts darker. I was really surprised by the greyishness of it, on a Pearl screen, and was glad to see the KTouch engineers solved that for their own (they’d told Nick Bilton they were dealing for awhile with the font lightness on that touchscreen), as it’s really black and crisp. BUT the KTouch has a couple of bad bugs I don’t like though I enjoy using it. I’d actually want to apply the updates; they usually include performance improvements – including in the underlying OS. Also, by not applying the update just to thwart B&N, you are effectively turning the NT into a battleground where you fight with the manufacturer for control of the gadget. I don’t want a tablet like that. Your saiid, “I’d actually want to apply the updates; they usually include performance improvements – including in the underlying OS. Also, by not applying the update just to thwart B&N, you are effectively turning the NT into a battleground where you fight with the manufacturer for control of the gadget. I don’t want a tablet like that. I understand what you are saying, but your argument still makes little sense. Lets look at the top tablet seller out there. Apple. Currently the same circumstances exist for apple os users. Many choose not to update the os and lose there jailbreak. So whether your an apple user or nook tablet user, you will never be 100% free, while having the hardware and priced tablet you specifically want. You know, I didn’t realize until we got into this discussion but you actually share my objections to B&N’s walled garden. The only way we differ is that you chose to defy B&N and I chose to get a different tablet. There are far too many tablets on the market for me to bother with one that I’ll need to fight over. Also, this is my chance to not give money to a company that locks down their hardware. As a matter of principle, I think it’s a good idea to do just that. Lol. Yes I hate walled gardens and agree that my approach fights BN. But as long as there are Nook Devs, the users win. After all the NT is locked down, but the devs rooted it. so if another update locks it down, the devs will address that…and soforth. The only objection I have with your logic of, “this is my chance to not give money to a company that locks down their hardware. As a matter of principle, I think it’s a good idea to do just that.” I mean if you truly felt this way, would you not have to turn in your apple product you own in to? I mean you seem to single out the nook or BN in your arguments for being against you, and thus you will not own them. But you seem to overlook apples fight against jailbreakers as a simular argument for not owning apple, but in the end, you do own apple products. Apple does the same thing, yes. Do we really want *everybody* doing it? Isn’t it better to support those that don’t instead of fighting a never-ending battle over a hunk of hardware? Apple has enough loyalists they don’t have to listen to us; B&N, however, isn’t *that* lucky. If they get enough returns and enough complaints they just might realize they’re driving customers away and, maybe, change. Whoa, that was a quick falling out of love! I’m still loving my NT. Once I installed GoLauncher, ButtonSaviour, Amazon Apps Market app, the walls of the the small, expensive Nook garden moved far away. I have been downloading the free Amazon app of the day, the Kindle reader, and various other apps on the Amazon Android market. So my garden is now large, even if still walled, but I have 1 + 32 GB of personal storage for photos, mp3s, documents, etc. The Fire’s ergonomics and small storage are a problem for me. If B&N’s OS updates somehow render my installed non-B&N apps unusable I would be “upset” and agree with Nate, but that hasn’t happened yet. Plus I don’t see a an alternative quality 7″ tab for close to the same price. The Motorola Galaxy Tab 7+ is sweet, but $400-500. The Lenovo A1 is a candidate, but it has a single-core processor with 512MB of RAM. Well said, you have reinforced many of my points, lol. Glad to see there are others out there that can see the value of the NT. I love mine and what was a very closed BN garden is now a big open android market garden, since i rooted it. Lol. funny, i got the tablet for the same reason you returned yours. i was able to fully root it in 10 minutes and i have a $250 fully open tablet. “and they got it on the market long before Amazon” – What, in ebook readers? Or do you mean in books? The Kindle came a full two years before the Nook, and B&N tried hard to race to catch up. And yeah, as noted above it’s easy to hack and has been for a while so this article is a bit out of date. So you haven’t read anything about the Kindle Fire as Amazon’s digital storefront? Okay, now this is a first. It’s widely agreed that the KF was sold at a loss so Amazon could get the customer into a closed environment where they could pitch more content. Given that Amazon sells music, video, and other stuff you can see why everyone reached that conclusion. The tablet as a storefront idea occurred to B&N first. They haven’t done much with it besides adding apps and enhanced ebooks, but they did it first. And this is different from the ebookstore on the Kindle. I’m not sure anyone uses it; it’s pretty crappily designed. I am not an Android expert by any stretch, but I understand the idea and value of rooting a tablet. I have some definite opinions about all this. I seriously doubt that Amazon is selling the KF at anything near a loss. I believe the price of the KF and NT are lower based on the idea consuming product from their respective stores. I also believe that tablet prices are out of line in general, iPad being the biggest offender, but supply and demand are real and so the market has decided that issue. Both KF and NT are designed to sell their products, BN really has nothing to sell comparatively speaking. Amazon is slightly better, iTunes being the best option. I’m not a fan of having to root my brand new device to get it to be open. Then the firmware upgrade undoes all that. No thanks. It’s a shame too, because if the NT was open, it’d be my choice for sure. So, I’m looking at Lenovo Ideapad A1. It’s not the best specs wise, but I can stomach the price and have the options I want. I’ll wait until pricing stabilizes and get a 10″ tablet, probably Android. well, i am sending back my Kindle Fire… thought I would love it, but it gets money out of my pocket way too easily for my comfort. It is pretty easy to install golauncher and the apps that give you access to the Amazon content – you don’t even have to root. I’m very satisfied with my tablet – really happy wit it. Question – I assume you are speculating that the next Nook Tablet update will create problems for those sideloaded apps, right? That would be a killer for me if it turns out to be true. I sure hope you are mistaken or just fearing the worse. Mine was delivered on the 23rd. By the 25th, I was ready to send it back because of the “walled garden” issue and how I realized that it was a selling machine. Over the weekend, I downloaded GoLauncher and Button Savior and Overdrive and I was plugged into Amazon’s Apps. I found a great audiobook player and I wavered. Although B&N is stingy and expensive when it comes to apps, I can get what I need free or a heck of a lot cheaper from Amazon. Anybody know why Angry Birds $2.99 on B&N when I can get it from Amazon for $0.99? Something like 1500 free apps on Amazon – I think I counted 50 on B&N. Another issue resolved by sideloading. Then today, when I was struggling to read a borrowed public library book on Overdrive and couldn’t change the text or background, I downloaded a Kindle book from my public library to the Kindle App on my NT. It was like night and day. Not as good as Nook’s dedicated reader, but I think this is the last straw. Unless I change my mind again, it’s going back. Ok, Sue, I get your frustration, but as you can read your Kindle book on the Kindle app on the Nook tablet, and it works well, I guess I don’t see your point. You can do everything on the Nook as well as you can do it on the Kindle – so no disadvantages. The sigificant diffference I see is that the Nook memory cand be expnaded with the SD chip, and the extram Ram, neither of which can’t be expanded on the Kindle. This isn’at an Amazon versus B&N issue – Amazaon is probably smiling because all the B&N Nook tablet buyers will likely purchase Amazon content and apps. So why not get the best of both? Well, I worry about reports that say that a software upgrade will take away the holes I’ve made in the “garden wall” and if that happens, it’ll be too late to return it. I’ve been flip-flopping on this. I like it, I don’t like it, I think it’s cool, I think it’s a PITA because I have to load other software, then I watch a video and like it, then I have to work-around to read a library book. I think I’m taking it back. If we find that they’re going to leave the hackers alone and let it be rooted, I’ll be back. I’d love to understand how consumers tolerate the walled garden thing (I’m not an Apple fan) when for everything that’s wrong with Microsoft and PCs, I can pretty much do anything I want to it, with it adding and subtracting my personal stuff at will. The Nook Tablet should embrace the idea of Android and let us run with the B&N branded tablet. Instead, I think they’re going to shut down my access outside the wall. Sue – I’m with you on the walled garden issue. I sure hope that B&N reads &gets your post. Most of the cows have already left the barn, so to speak, it would be self damaging for B&N to try and close the door at this point. Really damage their brand. I’m going to play the optimist and assume that B&N won’t be so foolhardy as to take on their customer base with such an aggressive move – but you make a good point. There is a risk that they could make a less than bright decision. I went through the NT experience when it came out. GoLauncher, lots of apps (for those who don’t know that’s what APKs are) and I was pretty happy until I got the “upgrade” that broke everything an sent me back into the walled garden. I figured that I could wait until the devs figured out how to get around it but decided it wasn’t worth the trouble. I was well beyond the time period to return my NT for a refund but after a chat with B&N tech support on their 800 # and a chat with the local NT expert at the B&N store near my home I was able to return mine for a full refund…except for the neat cover I had purchased. I gave it to my daughter for her Nook Color which I had rooted with the CM7 and told her to avoid the firmware updates from B&N. She and her kids are still happily loading apps from the Android Market and enjoying the rooted NC. I got a heavily discounted Lenovo K-1. When it “upgraded” it just updated Honeycomb. No walled garden, though Lenovo does have its own lame app store which usually charges more $$ for the same apps, or doesn’t offer “free” trial versions. The Kindle Fire is pathetic. I’ve had mine for 2 weeks, and it already has issues. It randomly disconnects from my WiFi and will not connect again. It freezes all the time and I’m returning it because it turned itself off and refuses to turn back on. It’s fully charged, I plugged it in-nothing, and holding down the power button for a reset doesn’t do crap. I just want to buy books, and read them. I don’t care about music on it simply because that’s what my ipod is for. I got the NT because of the children’s books that will read to you. My 5 year old LOVES it. BUT I want streaming video of titles that netflix doesn’t have but KF does. I also have the NT v1.4.1 and can’t find the latest hole that would make it work. Does anyone know. Right now I’m weighing childrens books (NT) vs many more options of streaming video (KF). I have until the 20th to retun my NT and may do so. Thoughts? B&N closed the loophole, sorry. You can roll back the update and root the book tablet. The instructions are in the fda forums. It may be a little intimadating but the only answer is to root your tablet. The recent update closed the easier sideload option. Google xda forums and follow the directions posted by indirect. You will need to reset your tablet to factory default first to get rid of the nasty update. Again, directions at xda forums. The root also includes a block for future updates. It was a little scary for me – I consider myself a strong user but no geek – but I made it through with the help of the posted video. I did have to delete a driver on my PC as per the discussion in the forum. After that it was smooth sailing. If you don’t want to tackle this you should consider returning the Book if the appear at B&N don’t meet your needs. I love the NT. It’s solid hardware, and I’d much rather have 32gb on a class6 SD card than 5 or 10 gb on a cloud that evaporates every time I change locations. The NT is also faster than the KF, and has a more readable screen (less glare). And I’m sure, if it doesn’t exist already, that there will be a dual-boot sd chip for sale on ebay like the one I bought for my nook color, which boots either nook os or full android, and doesn’t void the BN warranty. That cost a whopping 35 bucks, and pretty much required no technical skill beyond the ability to follow a few simple instructions. I read through most of these- but I guess it is over my head. I just want to know simply- can I play movies that I have downloaded on t0 my computer and convert them to nook format and just drag and drop them onto my Nook and play them? If so- what program do I use? I tried a couple and couldn’t find a Free one. I don’t want to have to root my Nook- I dont use hardly any apps.. I just want to be able to play movies- and not pay for them. That is why I got the Nook for me. I only have afew days– if I can’t play them, and I could just drag and drop movies on the Kindle fire, maybe I will be better off with that. Thanks for the help. I purchased 2 of the nook tablets within a week of each other. Out of the box they were very good, but I used Albert Wertz ‘root’ from microSD chip which took about 2 minutes, and have a full blown android tablet, tons of free applications / books / etc. and very fast speed. Look for Albert Wertz root, it is fast / simple / and very effective and the best thing is you can put it back to factory without the chip, just click on 2 programs using the file explorer and you are back to ‘normal’ nook tablet. I have rooted about 4 of them in the past week and they work fabulously. Wish I had understood this better before I bought it, I’m bringing mine back tomorrow AM. To get a “news” or a “weather” app, its not siple to even find, and when you do, you have to pay for it, for goodness sakes! I think you hit it right on the head, this device is theirs- not mine. It oughta be free if they want to charge for every single piece of content. Plus books are too expensive to buy ebooks. couldnt agree more, bought it because I thought the price point was attractive. so it does me no good for more than 50% of my day. No 3G or 4G, no camera. I think the key line in your post is “the device is theirs, not mine”..ie a paid content delivery device…and I feel like a schmuck that I paid 249 for the privelege of using it. Also, book prices are too high for an ebook format. I mean, even to get a simple app to deliver the daily weather forecast, you have to pay for it! For goodness sakes! If youre thinking this is an android tablet, it isnt real. very limited selection of apps, and none are free. You cant even get a trial of a magazine without your credit card on file. Not happy, another corporate scheme. I have now read the posts about rooting and programming and B&N closing loopholes and all that stuff. To me this is just more support for returning it. Who wants to be a programmer or do workarounds and anticipate their “next move to stop you” in order to use a device you paid good money for. I’ll find a real tablet for another 100 bucks and probably save more than that in apps that I dont have to pay for. B&N and Amazon are both corporate masters who seek more slaves in my opinion. Just leaving a helpful note here for anyone considering this E-reader. It can be rooted easily without voiding any warranties – just install your Android software on an microSD card; the device boots to the microSD card slot first, thus your root will never effect the original OS on the device, which continues to live on, untouched, on the device’s main internal storage. Note that the rooted Nook can then easily be used to read and purchase books from B&N, Amazon, or Google Books – just install all three apps. Because of that flexibility, I think the Nook beats the Kindle Fire easily. After about 3 months with my rooted Nook Color I also think any of these E-Readers will just make you want a full tablet with more horsepower under the hood. The screen on the Nook Color and the expansion slot are easily the best features; very nicely done by B&N. this is great if you’re talking about the NC (Nook Color…2nd generation) but the article started out about the NT (Nook Tablet…3rd generation). Hardware specs for the NT are quite a bit higher than the NC although the NC, once rooted, may very well prove acceptable for many folks. Definitely it’s fine for reading ebooks, and many apps as well. It’s probably better to NOT think about upgrading the base Android OS to Honeycomb or Ice Cream Sandwich, but just think about Gingerbread as the Android version of Windows XP…solid and long lasting. Great article! I have a rooted Nook Color and replaced the OS with CMOD 7. I bought the NC refurbished for $130 at Overstock. I was briefly tempted with the Kindle Fire because I have purchased three Kindle e-readers (currently use and LOVE the $79 model). Hi! I read your review about the Nook Color and was intrigued that you said you could hook it up to a keyboard. I am getting a N2A card for mine and was wondering where you got your keyboard. Did you have to get an adapter to hook it up to the Nook? I’ve found the Nook to be less jailed to any one ecosystem than the Fire is. And yet, reviews point to one of the strengths of the Fire as being tightly tied to a persistent connected ecosystem that charges you on average $3.99 for a movie to take with you and play offline, rented, limited viewing time. I love reading, and the Nook Tablet is amazing at it. I love how it makes itself centered around a relaxing reading experience, without a connected world as its focus. After all, I have a smartphone, a laptop, a desktop, etc that keeps me jailed to that side of the world. The Nook is refreshing in that it gives me the ability to escape and relax. I use it in an unconnected state quite often, especially backpacking and camping. I rip DVDs using Handbrake and stuff an SD card full of stuff and take it with me, free. No rental fees, and an amazing battery life. For $250, it’s quite good for what it is. I certainly can’t see the Fire as enabling this experience for me. And sure, I could get an Android tablet, but seriously, I don’t want to a) spend the $400-500 and b) deal with a full blown Android OS and the choices (I know this sounds stupid). I appreciate what the Nook does in simpler terms, and it allows me to really escape into a reading, music, and movie experience for a lot less money than people think. Free: all of the music and movies you want to put on SD cards as you want. SD cards are dirt cheap, buy a few, fill them with movies and music. Not Always Free: Books- fine with me, as I rarely spend > $10 for an awesome read. Cheap Subscription: If you’re into having a persistent connection, Netflix, Hulu, whatever else, I don’t know. Now, if I want a tablet in its traditional sense that gives me freedom of a computer to do whatever I want and be connected how I want to whatever I want to whomever I want, then certainly the Nook is NOT going to enable that. People, you all should be buying a tablet computer in that case, and not even a Fire. It’s not a question of what the Nook and Fire can’t do, there’s no question about what they can’t do and it doesn’t take a genius to point that out. But more eloquently, what they can do, and it’s not something that can be measured in specs on paper, is really great, and the Nook Tablet does it well for the price point. I read through a lot of the comments here about rooting and have to say that it is simple and it is definately permanent. Barnes and Noble cannot unroot the device or prevent the root process if you purchase a Nook Tablet with versions 1.4.0, 1.4.1, or 1.4.2. Barnes and noble cannot even update the device without their recovery rom, which is replaced during the root process. The best part is the root package requires only a 2GB SD card and about ten minutes from the time you download the files to the time the device is completely rooted. As an added bonus, the entire process is also reversable so you don’t have to worry about voiding your warranty. I currently run the stock Nook Tablet system with the Android Market to get free apps. All my apps from my Android phone were backed up using Titanium Backup and restored on the Nook with no problem. The Barnes and Noble reader and stores function the way they are meant to and every free app I pull from the Android Market (Google Play Store) work flawlessly. The icing on the cake: I picked up an 8GB SD card and loaded CyanogenMod 7 (a custom rom) onto the SD card and the Nook Tablet can boot that rom from the SD card and function as an Android tablet without touching the files associated with the Nook’s rom. Basically, you run a separate operating system from an SD card. I don’t use it all that much, but with the growing trend of tablet devices its nice to have that option, especially since it was practically free. Now, if there was only a way to permanently kill the unused DRM Service, my phone would be perfect! I like the IdolPad. It costs $99 and comes with Google Play. Well, there ARE the two Polaroid models I mentioned earlier. Battery life improves somewhat on them if the Phone.apk app in its /system folder is renamed or deleted, followed by pressing the RESET button on the back of the device. You’re a moron. It’s not an ‘android tablet’. It’s marketed as a ‘reader’s tablet’ for a reason. If you’re too cheap to buy a 600 dollar tablet, don’t complain when something that is cheaper doesn’t meet to you standards. The tablet is easily worth 500 dollars, but b&n sells it for 250 for the simple reason that it is to help out their business. That’s what business is. Would you say that McDonald’s free wi-fi is there to help them with their business? of course. would you say Apple charges 700 for something that is 500 to help their business? of course. don’t be a moron. If you really don’t want to be within b&n’s circle, root your device. I have the Barnes & Noble tablet and love it. I thought hard about the N2A card and decided to give it a try. It works flawlessly, I don’t have to remove the card to go between my original nook tablet, or the card that makes it an open android tablet which came with a lot of apps already on the card, a 32gb card still gives me 26.4 gb of space to use on the card. I bought the tablet for a reader, got the N2A for fun. I now have kindle books on the N2A kindle reader and just switch to have my regular nook back. I didn’t have to worry about ruining my nook. I also have had my nook for just over a month, so no problems with the card. I’m sorry to here all these things about the NT but I’ve had others and hacked as well and would have to say this is the most smoothest running and spiffy little tablet I have owned. It comes out of the box almost hacked no effort except for reading a little.Even a cave man can hack it an old fart like me with not too many hair cuts left managed. Man reading this makes me think the user isn’t very tech savvy at all. These are very easy to flash to Android Gingerbread and super stable with that version. They aren’t that stable with Ice Cream Sandwich yet, but they are working on it. I just flashed a brand new Nook this morning from Wal-mart and never even registered it on Barnes in Noble, it took less than 15 minutes to complete. If you don’t want to buy the SD card that flashes it, you can make your own like I did, and it takes longer to make the SD card than it does to flash the NOOK. I have a 16g nook that the apps can install to about 12g of the internal memory. It leaves 1g for the media such as music, videos, and pictures however a 32g SD card clears that right up! For $250 this is the 7″ tablet to get. If you’re not going to look at as a B&N device but simply a blank Android tablet, it still comes up short against the other tablets on the market at that time. I picked up a refurb that did far more and cost less. What’s more, the refurb had a warranty, something which a hacked Nook Tablet would lack. The Nook Tablet isn’t a very good hardware value, frankly. Oh also when it is Android the B&N stuff is still accessible for e-reading, and also allows for other e readers like google play books, amazon kindle, etc. This is the best of both worlds, and no reason to leave B&N software on it at all. Android is so open that this is the OS that should be on this tablet. All functions of the table work too, the Mic included! Ok i got my nook tablet for $150 on sale. Its rooted with android. The warranty does still apply because all you have to do is restore it. It will be like nothing was ever touched. Secondly. I may well be ignorant on this but name one thing that a tablet can do that my nook cant. Just one. Well keeping within the price range of course. And whats so bad about the hardware. Well distributed light weight, 4 gbs of ram, 16gbs of storrage, not to mention room for expantion which the ipad lacks. I personaly whould prefer an ipad but for $150 i can argue with a rooted nook. I knew before I bought the Nook Tablet that it is a walled-in device. But I bought it anyway because (1) I didn’t want/intend to buy yet another device I would have to spend mucho time on to hack, and (2) I just wanted a digital reader device to free me from the pain of finding a place for stacks and stacks of books. As hardware, I’ve found the Tablet very good. Setting it up was a breeze and I’ve never had any hardware problems. It even connected to WPA first time out, which is more than I can say for IOS 6.0 devices. But B&N has *serious* quality-control problems with content. I have bought 2 books in the past month that were defective; had to call B&N to request refunds. The first book had repeated pages and text overwriting images. The second book was 169 pages of whitespace. When I contacted B&N and the vendor of the first book, I got the typical each party pointing at the other as the guilty party. NOT COOL, B&N! My general experience with B&N support is it’s a bunch of monkeys on typewriters. I have had good experiences with Macs and IPods. So I’m thinking that the best thing to do is to get an iPad and put the Kindle and Nook apps on it. That way, I won’t be tied to a single content vendor. Anyone had good experience with this approach? If so, please let me know by sending email to era [at] pobox [d0t] com .